Featuring incredible illustrations and stills, the Star Wars Year by Year A Visual History Updated Edition Hardcover Book chronologically details the history and development of the Star Wars movies; the events, press, and logistics surrounding the making of each movie; and exclusive interviews with people who worked behind the scenes. 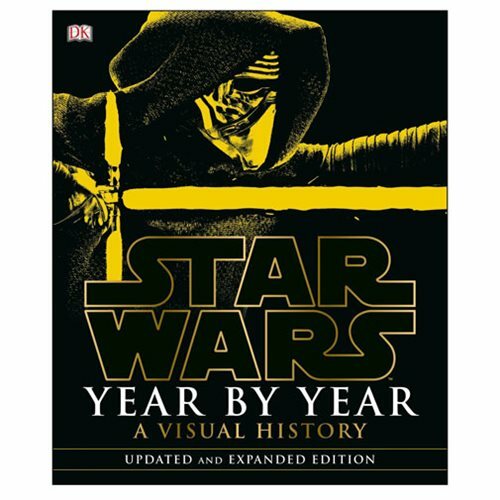 The Star Wars Year by Year A Visual History Updated Edition Hardcover Book measures about 12 1/2-inches tall x 10 2/5-inches wide. This 368 page book is a must have for Star Wars fans! Ages 13 and up.